Rack House Kitchen & Tavern, will open its doors (and smoker!) 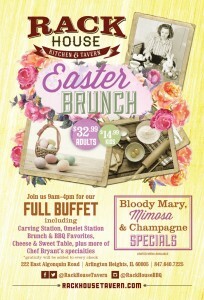 on Easter Sunday serving up Chef Bryant Anderson’s BBQ-inspired holiday dishes. As recently seen on WGN-TV’s Chicago’s Best “Best of Bacon” episode, Chef Bryant will showcase his house-smoked swine, salmon, honey glazed ham and prime rib all served buffet-style. Guests of all ages can feast on the brunch buffet with plenty of kid-friendly choices. Adults can enjoy $4 Bloody Mary and Mimosa specials. 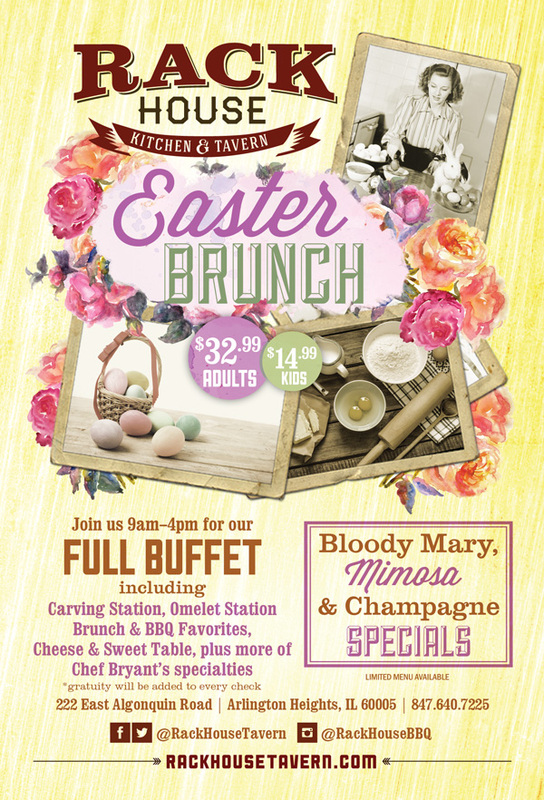 Easter Sunday Brunch will be Sunday, April 21 from 9 a.m. to 4 p.m. Pricing is $32.99/adult and $14.99/child 12 and under. Gratuity will be added to each guest check. In celebration of the holiday, guests who make a reservation at 9 a.m. or at 2 p.m. and later will receive 10% off their total check. Reservation are highly recommended.